The Port of Tacoma’s strong emphasis and leadership in protecting the environment and reducing stormwater discharge pollutants directed their engineering consultants, Kennedy Jenks Engineers of Federal Way, WA to evaluate a number of stormwater treatment devices for the Port’s North Intermodal Yard. 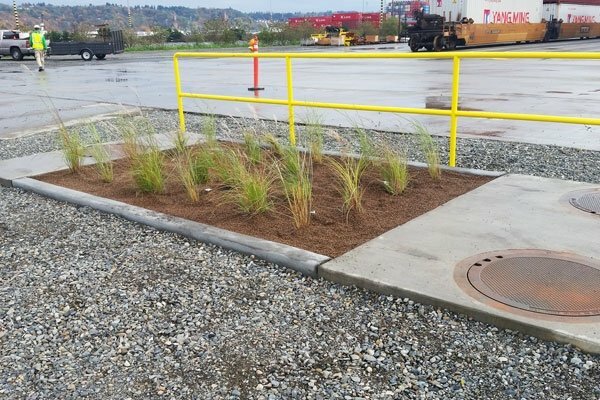 The Kennedy Jenks team of engineers and the Port staff contacted Modular Wetlands in January 2013 to discuss the current Port of Tacoma challenges with meeting their permit pollutant benchmarks. The Port of Tacoma is mandated to meet the existing permit requirement for the NIM facility (an adjacent 10 acre active shipping and maintenance site discharging to Commencement Bay) and expressed strong interest in implementing an advanced and maintainable stormwater treatment system that has proven capabilities to meet these stringent permit requirements. The National Pollutant Discharge Elimination System (NPDES) permit program is a requirement of the Clean Water Act and is intended to protect and restore waters for human and aquatic use. The US Environmental Protection Agency (EPA) has delegated stormwater permit authority to state environmental agencies and in Washington State, the NPDES-delegated permit authority, is the Washington State Department of Ecology (Lacey, WA). The Port has current benchmarks for Total Suspended Solids, Turbidity, and for Total Zinc. These waterways are deemed sensitive to shellfish, fisheries, and our annual salmon and steelhead runs (Commencement Bay is also a 303(d) listed waterway). Several existing site constraints limited the choice of available BMPs. The main challenge was that the site was very flat and the existing conveyance layout prevented existing treatment systems from working under these constraints. A majority of the Port’s impervious drainage areas are active, outdoors and yield pollutant loading concentrations that were to be specifically addressed through water quality treatment. Runoff has historically been collected through an existing shallow conveyance system and discharged directly to Commencement Bay in Tacoma, WA. After an in-depth engineering and cost analysis it was determined that a stormwater treatment system holding a current General Use Level Designation from Ecology for Enhanced Metals treatment would provide the best result in treating the Port’s NIM facility’s runoff. Given the above site limitations and WQ needs, two Modular Wetland Systems were chosen to specifically mitigate for these POCs. The MWS Linear incorporates a number of steps, namely hydrodynamic separation of incoming sediment, media filtration, and biological filtration via a horizontal flow subsurface wetland. An existing area in the northeast corner of the property, close to the outfall, was found to be the best location for installing two MWS Linear 8-20 Modular Wetland systems. Site runoff now flows directly to a flow splitting manhole which directs the water quality flow rate (0.96 cfs) to two “custom” MWS Linear vaults. Following treatment the water discharges back to a new collection manhole and then flows, by gravity, out to the Port’s outfall. The MWS Linear utilizes a specialty wetland media that contains no organic material, high hydraulic capacity and has been proven to exhibit exceptional pollutant removal, specifically for suspended solids and heavy metals. The wetland media has many distinct advantages over traditional bioretention soil mixtures commonly used in LID BMP designs. This unique industrial application was designed to capture, and treat up to a capacity 0.96 or approx. 430 gpm and covering a 10 acre impervious site. The MWS Linear Modular Wetland systems provided the Port with a heightened treatment level for TSS, Total Zinc and Turbidity. Over the last year of operation, the Port has met all permit benchmarks and has observed runoff effectively being treated prior to discharging. Operation and maintenance costs have not exceeded $1200 per annum – far less than other BMPs that were considered for the NIM facility. About The Port of Tacoma. The Port of Tacoma is an independent seaport located in Tacoma, Washington. The Port owns more than 2400 acres of land that are used for shipping terminal activity, warehousing, distribution and manufacturing. The Port is among the top ten largest container ports in North America. The ocean containers hold everything from computers, to furniture to fruits and frozen meats. China is the largest of the Port’s trading partners.